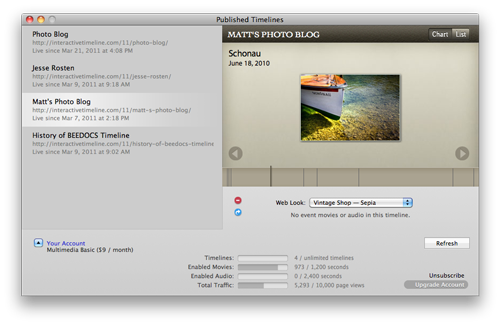 How to publish timelines with multimedia and to high traffic sites. When you purchase a Timeline 3D license, you are automatically signed up for the free plan and no further registration is required unless you want to upgrade your plan. However, if you would like to include audio and movies in your timeline events or if you plan to embed your timeline in a high-traffic website, then you will need to ugprade your web hosting account. Go to Manage Published Timelines in the Share menu. Click Your Account in the lower left hand corner of the window. Select the plan that works for you, and click Subscribe. You will be directed to a purchase page where you can sign up for a monthly subscription. Best for blogs, personal sites, small businesses. Best for schools, businesses, popular blogs. Best for news media, high traffic websites. None of your published timelines will have advertising or any restrictions on commercial use. All hosting plans include the ability to embed timelines in other sites (though embedded timeline views count as page views). Timeline 3D is designed for professionals and so is our web hosting. Over 90% of our customers should be able to use one of the first two plans… either the free plan or the “Multimedia Basic” plan depending on whether or you require movies and audio in your events.